Postcard showing Central Avenue (now Central Boulevard) at the corner of Court Avenue in Orlando, Florida. It shows the Benevolent and Protective Order of Elks Club, as well as the intersection of Central and Orange Avenue. The Elks Club building was constructed circa 1910 and demolished circa 1955. The cost of construction was $8,500 and the architecture was designed in the Modern Eclectic style with Bungalow elements. The Orlando Lodge of the Elks was founded on June 28, 1907. The Lodge rented space, first from the Odd Fellows and later the Young Men's Christian Association (YMCA) prior to purchasing the land at Court Street and Central Boulevard for $1,250. Orange County eventually bought the property and demolished the building at the same time that the 1892 Orange County Courthouse was being torn down in preparation of the building of the Courthouse Annex building. The ground where the Elks Building once stood was turned into a parking lot for the Courthouse. The Elks moved to 409 East Central Boulevard and remained there until a fire destroyed the lodge in 1969. Afterward, the Elks moved to 12 North Primrose Avenue. The parking lot was eventually redeveloped into Heritage Square after the demolition of the Orange County Courthouse Annex in the late 1990s. Heritage Square opened in 2000. Original color postcard: E. C. Kropp Company, Milwaukee, Wisconsin: Private Collection of Thomas Cook. Digital reproduction of original color postcard: E. C. Kropp Company, Milwaukee, Wisconsin: Private Collection of Thomas Cook. Originally created by E. C. Kropp Company. "Elks History Project." The Benevolent and Protective Order of Elks of the United States of America. http://www.elks.org/history. 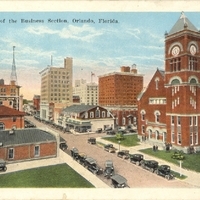 “A Glimpse of the Business Section Postcard.” RICHES of Central Florida accessed April 22, 2019, https://richesmi.cah.ucf.edu/omeka/items/show/967.